We are an independent shop affiliated with the original Bonsai Pixels and using assets provided by miirshroom. Here, using your hoarded Treasure and Gems, you can build and decorate a signature-sized bonsai tree...or an entire bonsai forest! The goal of this particular shop is to provide currency-paid options for players who would rather not have to design their entire bonsai themselves. Taking a brief break from accepting orders for any of my art shops. I'll be back soon! 04/11/2017: Reopened for Limited Orders! November 18, 2017: Nothing of particular note to report! This Affiliate shop specializes in planters that are largely Artist's Choice, with the option to choose a few specific items that you'd like to be shown in your planter! Check the Weather Effects post to decide if you would like snow cover or falling leaves in your bonsai. Post Order Form in this thread and send a Private Message with the required treasure amounts attached. Notes: If possible, I'd like it fairly dense! Note: It is highly recommended that you save and host your completed order off-site, as we have had problems with our hosting services in the past! Covers up to about 5 specific requests made at the time of the upgrade. The rest should be left to Artist's Choice (i.e. items remain in relatively the same positions. Locations of creatures and some plants may be adjusted as required for balance). Covers switch from planter to pots or vice-versa. Changing the Season of the Bonsai tree or switching it for a different tree. There are 12 available "Configurations" of either 150px. or 200px. width and each consisting of 2-3 pots. 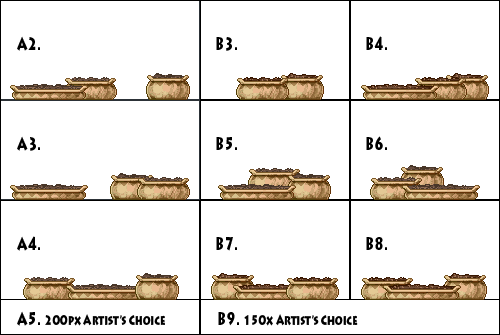 Since these are modular configurations, longer scenes can be made by adding multiple configurations next to each other, which would be specified at the time of ordering. Pot colours can be mixed in a single order. Specifying pot colour in your order allows customization of all pots. Currently available upgrades to the basic dirt substrate are shown below. Bonsai trees are selected from 4 different stages that reflect the Real World Seasons. *Note: Assumed that larger version is being ordered unless specified otherwise. It is advised to pick with care, when you pick a prickly pear. Finding a wasteland pear is easy. It is finding one that is not a dried out husk that presents a challenge. Eating this will either give one extraordinary powers or intestinal distress. Or extraordinary distress and intestinal powers. As an alternate version, many small prickly pear fragments (i.e. 1-2 node cacti) can be scattered across the substrate in a custom-built cluster. White roses can take on many colors by tinting their water. Plant connoisseurs have also tried to encourage them to take on other flavors as well. This one tastes faintly of blueberries. Consuming or gifting these flowers is good for one's heart. These small roses are a favored gift to the smaller dragon species. A romantic bouquet and dinner for dragons. Plants and Creatures are based on the food items available through Flight Rising activities. Many items have more than one "pose" so that there can be greater variety in planter compositions. There are 5 general descriptors used to categorize plant items. Ground-cover: Effective at covering the substrate without much interference with the leaves of the Bonsai. May interact slightly with the planter edge. Grows on Bonsai: Either grows on trunk, hangs from branches, or both. Overhangs Planter: Ground cover that also grows over the edge of the planter. Medium Plant: Grows past lower branches of most bonsai, but not much higher. Extra-Tall Plant: Narrow stalks, but approach the same height as the Bonsai. It may be plentiful, but it tastes like dirt. Many dragons agree that Sea Grass has a much better flavor than the more common seaweed. All manner of creatures can hide in this tall grass. Some dragons prefer to chew on Sweet Grass for hours rather than devour it quickly. Ground-cover. 2 varieties: short grasses and long grasses. A dull gray by day, Star Moss sparkles vibrantly at night. Some say it even tastes better then. This mold grows only on dead trees, thus it's plentiful. Many dragons dislike scrubs, but sometimes you have to settle for whatever's available. Hard to believe this is the preferred food of many gigantic sea beasts. Ground Cover. Delivered in clumps. Though the spores of the Cindershroom indeed look like smoldering cinders, it's mostly harmless. Visions of Mycena Mushrooms dancing in your head is a sure sign you've eaten too many. Some dragons insist diseased fungi are zestier than regular fungi. Everything looks strange in the light emitted by this mushroom. Ground-cover. Selected at random from 3 different cluster shapes. This weed is used in herbal remedies to soothe itchy scales. A delicious addition to any salad. It remains unknown if the origin of the name comes from the color of the flowers, or the slight toxicity that can raise a dragon's temperature. Legend speaks of a very rare clover that can unlock anything and uncover buried treasure. This isn't one of them. The extremely rare eight leaf Lucky Star is said to bestow good luck for life. Unfortunately, this isn't one. This hardy plant is sometimes the only sustenance found for miles. It also tastes awful. This clover grows only in absolute darkness. It shrivels quickly when exposed to sunlight. Ground-cover. Slight overhang. Delivered in clumps. Clover flowers available. Consuming this flower gives dragons of the fire flight the sudden urge to channel their magic into projectile spheres of flame. A virulent bloom, prized for the deep red dye it can produce; abhorred for its tendency to strangle other plants and take over a field. Harvested as a hard-shelled pod, these plants appear to bloom when slow-cooked over a fire. Ground cover. Slight overhang. Flowers and pods available. Stonewatch harpies may have evolved their plumage to better camouflage with the native plant life. Chewing this plant will dye your teeth blue. Consuming this lifts a dragon's spirits. These leaves have a metallic sheen, but are not composed of actual silver. This plant protects itself with a powerful poison condensed into just a few of its leaves, rendering them useless for photosynthesis and purple in color. Eat the green bits with care! The leaves of this plant are dry and brittle for most of the year, but gain flesh and color for a short time after infrequent rainfalls. This aquatic plant grows on the edges of caves and waterway entrances. It requires the low light and high mineral content such environments provide. A mild pastel under normal lighting conditions, this plant flares to a brilliant glow when magics are worked in its vicinity. Medium. Ground Cover. Tall grass with short flower-spike. A version that is only the tall grass may be used occasionally when many Threshes are ordered at once. Creates a sweet, grassy note when boiled down and added to a dish. Lovely when in a vase or in a tummy. Medium Plant.Typically delivered in single clump. Eating these mushrooms is rumored to make a dragon grow. Eating this mushroom is rumored to make a dragon shrink. Medium. Ground Cover. Often delivered as either one mushroom cluster, or a pair of two solitary mushrooms. This species of flower only grows from the cracks of mesa walls. When not used as a snack, this milkweed can also be ground up for pigment. Art you can eat! Extra-tall plant. Flower clusters along a tall leafy stalk. Selected at random from 2 possible shapes. This hardy plant provides herbivorous dragons with a valuable source of food during long winter months, but tastes awful. A common myth about this flower is that it sings at midnight and those who consume it are said to be bestowed the gift of a beautiful voice. Most of the time it simply results in terrible indigestion. Extra-tall plant. Tall flower-spike. Selected at random from 2 possible shapes. Many herbivorous dragons will plant beds of tulips for a cheerful display of color around their lairs and a tasty treat in their bellies. Eating these will turn your tongue blue. Plant eaters consider bouquets of Carnaval Tulips to be 'edible arrangements'. Medium Plant. Tulip head just above mid-height of the planter. Selected at random from 2 possible shapes. While most dragons go straight for the seeds, the leaves of this Amaranth are also harvested by the thrifty forager. The seeds, leaves, stems, and roots of Amaranth can be eaten by a hungry dragon, with nothing gone to waste. Naughty hatchlings will pass their Greenstripe Amaranth to familiars to get to the dessert course faster. The seeds of Amaranth can be ground into a nutritious grain. Medium Plant: Selected from 3 different sizes. Amaranth (A) is the standard version and Amaranth (B) is the alternative decorative version. Medium to Extra-Tall Plant: Daffodil head just above mid-height of the planter. Selected at random from 3 possible shapes. Alternatively, can be ordered as the leaves only - i.e. no flower head. Grows along the shaded paths of the forest. A great choice for those foraging for dinner. A naturally occurring plant that is frequently mistaken as a sign that a irate dryad is nearby. Medium to Extra-Tall Plant.Delivered in clusters of 2-3. A night-blooming plant, Umbra Parthenium is irresistible to herbivorous dragons. A tasty treat that may also prevent headaches. Extra-Tall Plant.Selected from 2 possible shapes. One has to be careful when eating a cactus. No one likes a belly full of needles. Instead of being filled with water, Ashfall Pricklers contain a spicy sauce that goes well with anything. Weird. Curiously enough, the spines of the Notocactus are rubbery and harmless. It may seem odd to find cacti in the tundra, until you consider it's just a colder sort of desert. Medium Plant: Often delivered as 2 cacti of different size; may be grouped together or not. There are 4 general descriptors used to categorize creature items, to give an idea of the quantities that would fit in the Bonsai planters without overcrowding. Small: Recommended quantity of 3-6 in the smallest (100 pixel) Bonsai planter. Medium: Recommended quantity of 1-3 in the smallest Bonsai planter. Large: Recommended quantity of 0-1 in the smallest Bonsai planter. Extra-small: Exclusive to some insects. Items in this category may receive either multiples of the same creature, or may be paired with a unique special effect. Known for staying awake for days on end, the Java Sparrow is an excellent source of energy. This sparrow can fly amazingly high, only to pass out from lack of oxygen. They tend to be short lived and squishy. This songbird has an excellent memory, so the survivors of its flock surely won't forget you. As small and plentiful as this bird is, most dragons consider it junk food. Bet you can't eat just one! Dragons who choose to bond gold-throated sparrows as familiars often have a difficult time keeping them out of the bellies of their clan-mates. Small Bird: 3 perched poses and 1 flying. Can perch in the leaves of a tree, or on the planter/base of tree trunk. White variations of this budgie are rare, and for some reason are frequently attacked by the Black-Caps. For reasons unfathomable to those who eat them, budgies are sometimes kept as pets by elderly dragons. The song of the Oasis Songbird has saved many a thirsty dragon from death by leading them to water. Unlike most canaries, the Bog Canary's singing is offensive to any ear. These tiny birds feed upon the sweet nectar of cactus flowers. Given the high sugar content of its diet, eating too many of this hummingbird can make small dragons hyper. This is the only hummingbird known to actually hum. Frostbite hummingbirds are the messengers of the Icewarden. These tiny beings are minor ice spirits and not living, breathing birds at all. Greyback sparrows' plumage mimics the much larger, more dangerous clouddancer. This species has the peculiar habit of perching upside-down. Small bird. Big heart. Also big beak; watch out! Some dragons keep flocks of these birds as pets for companionship and scale-cleaning services. Scores of bobwhite quail adults come together to build large community nests in rock crofts and trenches. In one of the most humorous displays in the animal kingdom, males of this quail species race one another to attract mates, rather than fight. There isn't much to be said: this quail is just lookin' sooooo good. Valley Quails are misnamed. They actually live at the crests of hills and mountains. Medium Bird: Female and male variants available. May be standing on ground or sitting in Bonsai. Males of this species of poultry crow loudly when the sun sets. Unlike most of the animal kingdom, the females of this species of fowl fight over the males. And it is BRUTAL. The toughest, most intimidating forestfowl around. Cousin species to the black orpington. This here's a nice, I say, a nice specimen. Though, it's got more nerve than a bum tooth. Large Bird: 2 poses: standing and sitting. Chicks also available (2 poses). Magpies are hunted for both their meat and their amazing collections of shiny things. Only males display the vibrant 'bleeding heart' coloration for which this subspecies is named. An uncommon sight, made even rarer after you finish your dinner. Large Bird: 2 poses: back facing the front (can sit in trees), and profile view (can sit on the substrate). Both can stand on the substrate. Medium Bird: Most commonly perches on tree-trunk, but can be placed elsewhere if space permits. Many seekers never grow a third eye. As a result, their size and intelligence is greatly diminished. These birds are often preyed upon by the larger Storm Seekers. This cannibalism may be an attempt to cull weak blood from their lines, or it may simply be opportunistic predation. Medium-Large Bird: 2 poses: back facing the front (can sit in trees), and profile view (can sit on the substrate). Both can stand on the substrate. Smaller sized version of Crow sprites. Living in arcane-infused fields does strange things to Satin Mice. All that matters is they're magically delicious. The Roan Mouse is considered a fancier variety of mouse, yet it tastes like any other. Named for the way it sparkles in sunlight, this strange rodent can leap great distances and has a tendency to brood. The days are much too bright for the Duskrat, thus they only come out at night. Small Mammal: Most commonly placed on ground, but can be placed in some lower tree branches. Most active during storms, the Static-Charged Lemming can deal a nasty shock to predators. When their numbers grow too large, Singed Lemmings run en masse into the mouths of volcanoes. The Arctic Lemming is the most dastardly species of lemming. The eyes of this lemming stare into your very soul. It knows all your secrets. It slumbers beneath the ground with only its spines exposed. This tiny terror is named after its similarity to a greater sandstrike. Green food is full of vitamins! Hedgehogs remain at the top of the ''Most Un-Digestible Snack Food'' list. It's no speedier than any other hedgehog, alas. Medium Mammal: 2 poses. Best placed peeking out from behind vegetation. While most bats are active at dusk, Ashfall Bats emerge from their caves as volcanic ash rains from the sky. The Nightwing once nested with a darker, more cunning species of bat. That other species is now extinct. What's worse than a plague rat? This thing. The Brown Bat is the least appreciated of all bats. Medium Mammal: Flying or hanging upside down. (note: not all bonsai support hanging bats! Maple #1 are the best-suited). Though their diet consists primarily of nuts, some squirrels long for a grapefruit. The Red Squirrel is known for its erratic, some might say screwy, behavior. This species of squirrel spends its life on the ground, perhaps because it can't jump. Melancholy cousin of the common grey squirrel. Medium Mammal: 3 poses. One of these poses is for crawling on tops of trees. The other 2 can be shown holding small items, such as acorns. This species has managed to thrive even in the aftermath of two apocalypses. All divergent species of rabbit claim Old World rabbits as their living ancestors. Foolish dragons plummet through banks of snow in pursuit of snowshoe rabbits. When confronted with tone-deaf dragons, smaller dragons will plug their ears with cotton balls. Larger species will plug their ears with cottontail rabbits. Marsh rabbits produce an oil to act as a water repellent. While it does not taste very good, it is not an effective dragon-repellent. Difficult to catch, and more difficult to hold onto. The poisons this frog secretes can revive an unconscious dragon. Snuggling with your new friend is not advised. Small Amphibian: Best placed sitting on top of objects or otherwise isolated from clutter. Can also be placed on the sides of pots. Treesnakes spend the majority of their lives under fallen leaves on the jungle floor. Who was in charge of classifying this one? Mysteriously hot-blooded for a reptile, the burnserpent uses its body heat to startle predators while it wriggles away. Corn snakes may come in a variety of colors. This one is a butter corn. Don't tell your lair mates this tidbit, as this may make your new friend sound more appetizing. Small-Medium Reptile: Treesnake and Burnserpent can be wrapped around bonsai branches, or coiled on planter. Corn snake has two poses for being coiled on planter, but none for being in the tree. Found only in the most arid regions, the Dust Slither can easily be tracked by the winding trail it leaves in sand. The bright coloring of the Coral Snake warns of its potent venom. Devour them carefully. This snake is named not for its color, but rather for its curious love of olives. This particular species of snake lacks venom and is quite docileâ€¦ that is, unless you are a rat. Medium Reptile: 2 poses: Coiled overhanging the planter edge, or raised into the air as if preparing to strike. The stripes along a cave gecko's hide become bio-luminescent when it senses danger. Not nature's proudest moment, there. Leopard geckos often slap the sides of rocks and trees with their flattened tails to signal if predators are approaching. Excellent camouflage helps this creature blend in with leaves and grasses. Colorblindness doesn't help it when looking for a hiding spot. An incredibly potent layer of poison film covers this reptile's hide. Medium Reptile: Stands on substrate or hangs over edge of planter. Large Reptile: Hangs slightly over edge of planter/pots. Can sit outside of planter. 2 poses: Face forward or looking to side. Nocturnal blue bandits never acquire their own food. They are often found escaping with insects stolen from the nests of groundbirds. Mud turtles are often mistaken as flat-faced stones laying in moist riverbeds. Using them as stepping stones is not encouraged. If you can get past the nasty bite of a snapping turtle, the meat is quite delectable. Ouch, that smarts! This species of turtle is known more for its valuable patterned shell than for its taste. Large Reptile: 3 possible poses & 2 sizes. Can sit outside of planter. Body shape varies depending on the turtle. Most bees can easily find their way back to their hive. Perdita Bees, on the other hand, are easily lost. The White Lace Honeybee rarely stings. Some say it's too ladylike for that. The only insect that comes presweetened. Upsetting hives of this insect can either lead to a great feast or a lot of bee stings. Blow flies are very common in the summertime, and generally swarm dragon caves to keep cool. Flies are pests, plain and simple. Their favorite places to be are inside dragon ears and nostrils. The gold fly has a very painful bite. If left untreated, it can become quickly infected. Tachinid fly carapaces are sometimes ground up and used in tinctures and tonics due to their highly valuable restorative properties. Despite its size, the common froghopper is able to jump much higher than the common frog. The bright blue thorax on the Alder Spittlebug is meant to scare off predators, not attract mates. The Red and Black Froghopper is a lot less dangerous than it appears... if one considers a something so tiny to look dangerous. Gardener dragons love having these little ladies in their garden. Better not tell anyone that you snatched this one up! While lady bugs are a gardener's joy, bean beetles are considered a pest. Eat them before they eat your flowers! Dry and disappointing on the outside, gloriously dry and disappointing on the inside. These beetles perform acrobatic cartwheels as they fly. Truly a challenge for young dragons to catch! Every year, vast numbers of this butterfly migrate across the plains. It is called the blue harvest. The gritty texture of the Meal Moth can leave a bad taste in the mouths of some dragons. This wicked insect is immune to fire, so it often lures predators to their doom by flying through bursts of lava. Caution: Excessive consumption of this butterfly may cause cabbage farts. Think of your den mates. Small Insect: Flying and perched poses available. This combative mantis is easy to provoke. It flails its arms in broad, circular motions between attacks. Reports that this bug causes jungle fever are wildly exaggerated. It's harmless and quite tasty. So named for its appearance of piety, the prayers of this Highgrass Priest sadly could not save it. This mantis feasts solely on the brains of other creatures. Small Insect: There are two slightly different sizes using the same pose. Your average garden snail just wants to stand in the middle of where you walk every day, flirting with catastrophe. Oddly enough, white lipped snails move very fast. They're also very poisonous to all but a few dragon breeds. Land snails, on the whole, are much grumpier than air or water snails (for obvious reasons). The vivid stripe patterns along this snail's back indicate its age. Unlike fleas, ticks, and mites, the occasional freeloading scarab is actually helpful when Serthis need to molt. The most adequate way of testing a poison is by tossing a bug in there and just seeing what happens. Or you could just eat this one instead and not waste food. Scaring up a meal wherever it can. This beetle's motto is 'When life gives you dung, make a dungball.' This advice may be taken or discarded now that life has given you a dung beetle. Small Insect: Crawling on planter/tree-tops or flying. These arctic insects leave beautiful crystalline spirals on dragon lairs. They derive their power from the full moon. These moths fly erratically around the sites of Arcanist's experiments. They make your tongue glow when eaten. Medium-Large Insect: Perched or flying. Typically placed near top of planter due to long tails. Catocalas have a varied texture on their upper wings that allows them to perfectly blend with their surroundings. A thrifty dragon will save the wings of the Dark-bordered beauty and use them in decorative arrangements for display around the horns. Though not as prevalent as eye of newt, micromoths are a common reagent in many magical remedies. 3 flying poses and 2 perched poses available. Runic Pug Moths can be recoloured to match any elemental flight. This high-class insect only makes its home in the most beautiful of rainforest gardens. You won't ever catch it anywhere near a bush or a tree. Known for their incredibly long lives and migration patterns, it is not uncommon to see the same butterfly swarms year-after-year. Medium-Large Insect: Wings outstretched in flight, or folded. Note that folded option shows brown wing underside. Clay is used in making bricks, pottery, and reinforcing dens. On occasion, dragons will ingest clay to soothe upset stomachs. Forget other boulders you've seen. This one is lookin' soooooooo good. It's a very attractive boulder. Moss and grasses can be added growing on the brick pyramid and brick wall. A very soft sulfate mineral that can commonly be used in plasters and sculpture. Many artisan dragons will use chunks of gypsum like a chalk to draw on rocks, cliffs or caves. A carved relief that depicts a story of a Guardian dragon hatchling journeying to find their ward. These conical structures can take thousands of years to form. The most incredible limestone stalactites can be found in huge caves beneath the Pillar of the World. Named for their supposed resemblance to the darkened sludge that is said to drip from the shadow god's eyes, these structures are surprisingly robust; if chipped off, they can be used as chisels or nails. Also commonly known as lavacicles. Single, double, or triple configurations available. Can be ordered with or without a top beam. Can order components according to the letter/number key, or leave it to Artist's Choice. Small ground cover plants can be added to the beam (column height will decrease accordingly). A finely-sanded plank made from the trunk of an ash tree. Dragons use planks to construct barrels, tables, or wagons. A finely-sanded plank made from the trunk of a birch tree. Dragons use planks to construct barrels, tables, or wagons. A finely-sanded plank made from the trunk of a cedar tree. Dragons use planks to construct barrels, tables, or wagons. A finely-sanded plank made from the trunk of a pine tree. Dragons use planks to construct barrels, tables, or wagons. An ancient stone bearing the ancestral rune of the Earthshaker. Such a find should be kept as a prized possession. Brown and Grey Balanced Stones are freely configurable, but specific arrangements (bridges, towers, inukshuks, etc) can be specified. These brilliant, banded stones are said to ward off predatory birds. They are of significance to especially superstitious Raptorik. This agate is named for the sharp-angled bands within it that resemble the outlines of fortifications of a stronghold. These brilliant green stones are often used as game pieces for the Sornieth variant of mancala. This banded stone is a popular gift in the Windswept Plateau, and is commonly set in decorative patterns at the entrances to wind dragon lairs, paired with protection charms. This foggy green crystal is often used in trading and bartering among harpy beastclans. It has even been adopted as a currency by some dragon clans in the Shifting Expanse! Everglade lashers that live near olivine deposits take on an especially brilliant emerald hue. This striped rock has been smoothed and polished by water. Top stone in stone pile can be replaced with a runestone purchased at time of order. This stone is opaque and ready to be carved by a careful hand or claw. This mineral provides an iridescent display of reflected light. Apatite occasionally carries extremely rare metals. Extracting them from this mineral can be exhausting, and inhaling the residual dust from this process is known to cause insatiable hunger pangs. The vibrant red has earned this variety the nickname ''Bloodstone''. Legends say that most of the realm's amber was formed in an ancient battle between the Flamecaller and the Gladekeeper, where terrible forest fires polymerized resin within the trees in the Viridian Labyrinth. Onyx is a common material in centaur arrows and other weaponry. Large deposits of almandine are sometimes mistaken for rubies, though they are actually a type of garnet. Massive quantities of celestine are found in the pillar-like rocks that stretch out below the Observatory, but almost nowhere else in the realm. This pinkish beryl is pulverized and pulped with other materials to create the parchment used in Eternal Youth scrolls. Exposure to the stone alone will not reverse aging, though some create jewelry out of it and wear it in hopes of living a long life. Of particular interest in its gemstone form, chrysoberyl is one of the Ashfall Waste's biggest export materials. Large and consistent quantities of this mineral are created by the constant expansion of the Blacksand Annex. These effects can be added to your bonsai for an extra 20k fee.